LibSBall is a library for communicating with Spaceball 2003, 3000, 3003, or 4000 FLX Six-Degree-Of-Freedom virtual reality controllers made by 3Dconnexion. The Spaceball allows you to move and rotate in any direction simultaneously. The device connects to your machine via a standard RS-232 serial interface. LibSBall can be used along with OpenGL or other real-time graphics APIs to write virtual reality software, games, or other applications. The Spaceball provides high resolution translational and rotational information, suitable for even the most demanding tasks. 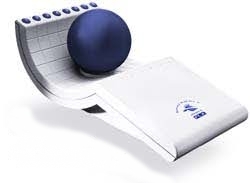 The Spaceball has either 3 or 9 general purpose buttons (depending on the model), all of which can be read by an application using LibSBall. The current release version of LibSBall is 0.1. LibSBall has been used successfully on Sun Solaris 2., SGI IRIX 6.2, OpenBSD, and Linux. Includes the "sballfly" OpenGL demo as well. Call for links! If you've written something cool that uses the Spaceball, send me a WWW link to your code or your WWW page and I'd like add it to this list. VMD: The molecular visualization program VMD uses libsball for all of its Unix versions. NCSA CAVE library: The NCSA version of the CAVE library incorporates a modified version of the libsball code. Tachyon parallel ray tracer: I've written an OpenGL previewer and a spaceball-fly feature for Tachyon which allows you to fly around in a scene using the Spaceball. Its done using a first-person view, and was the code I simplified in order to write the "sballfly" demo which is included with libsball.